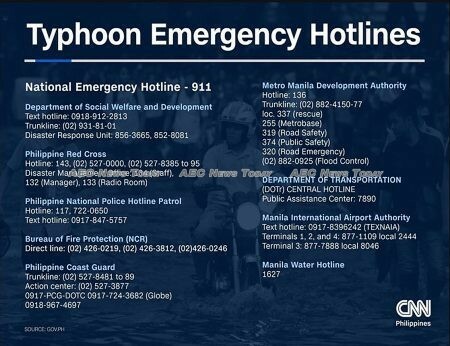 The latest updated information from the Philippines weather service forecasts Typhoon Ompong to hit the Northern Luzon region of the Philippines in the early hours of tomorrow morning, September 15. Packing winds of 205 kilometres per hour (about 127 mph) and gusts of up to 255 kph (158 mph), Typhoon Ompong as it is called in the Philippines is expected to make landfall in the Cagayan-Isabela region between 5:00am and 8:00am Saturday. It is currently moving Northwest at 20 kilometres per hour (about 12.5 mph). The latest bulletin issued by the Philippine Atmospheric, Geophysical, and Astronomical Services Administration (Pagasa) said winds between 121 and 170 kilometres per hour (75- 105 mph) are expected to sweep through the areas under typhoon signal alert in the next 18 hours having a catastrophic affect on plantations. The public has been warned to expect cuts to power and communications services. In a statement delivered at Malacañang Palace earlier today Agriculture Secretary Emmanuel Piñol said that about 1.220 million hectares (3.019 mln acres) of rice and corn fields are likely to be severely damaged by Typhoon Ompong. “On a matter of moderate basis rice will suffer losses amounting to about PHP3.6 billion (US$66.670 mln), while on a worse case scenario PHP7.9 billion ($146.320 mln) could be destroyed”, Mr Piñol said via CCN Philippines, with estimates by the Philippines Department of Agriculture (DA) forecasting losses of between 74,000 to 176,000 tons. With many areas of the country placed under storm signal alerts, including Northern Aurora, Isabela, and Cagayan (Signal No. 3), thousands of domestic and international flights have been cancelled, while schools in areas subject to alert have suspended all classes. 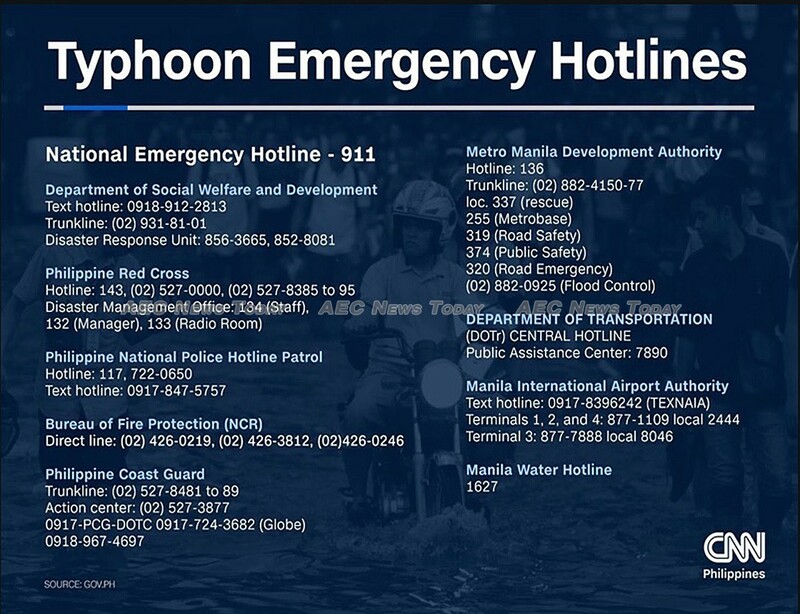 According to Philippine officials some 10 million people are at risk from the path of Typhoon Ompong with civilian and military personal working frantically to evacuate those most at risk. Based on available data Pagasa, at around midday today, placed the eye of Typhoon Ompong some 500 kilometres (310 miles) East of Baler, Aurora (16.4°N 126.2°E ), warning locations under storm signal warning levels one, two, and three to prepare for torrential rains, gusty winds and up to six meters of storm surge in the areas of Cagayan and Isabela. “When the ‘eye’ of the typhoon hits the community do not venture away from safe shelter because after one to two hours the worst weather will resume with the very strong winds coming from the south”, Pagasa warned. According to CNN meteorologist Brandon Miller the wind speed of Typhoon Ompong can be likened to that of a Category 5 hurricane, warning it is “bigger, stronger, and more dangerous” than Hurricane Florence before it weakened to a Category 1 Storm earlier today. The Philippines government has readied PHP1.1 billion ($20.341 mln) in cash and relief supplies for immediate disbursement in the wake of the storm. Also in the path of Typhoon Ompong is southern China, Vietnam, and Lao PDR. Live updates for this story have now concluded. Stella-maris graduated with a Bachelor of Arts, Education from Ebonyi State University, Nigeria in 2005. Between November 2010 and February 2012 she was a staff writer at Daylight Online, Nigeria writing on health, fashion, and relationships. From 2010 – 2017 she worked as a freelance screen writer for ‘Nollywood’, Nigeria. She joined AEC News Today in December 2016.